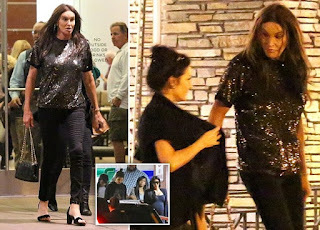 Caitlyn Jenner was seen going to the cinema, while the rest of the Kardashian and Jenner clan remain at Lamar Odom's bedside. She was there for every big moment in the Kardashian Jenner household, even giving away step-daughter Khloe at her wedding to Lamar Odom. But Caitlyn Jenner remained in Los Angeles on Saturday, as the rest of her reality show family rushed to Las Vegas to be with Lamar. This shows how spilt the once close knit family have become. Caitlyn went to the cinema with a friend, no longer part of the Kardashian inner circle.